Peter Doig is considered to be one of the most important British painters living today. His works are often highly painterly and are figurative, putting him at odds with some of the trends that were present when he was studying and finding his creative territory. The highly personal aesthetic position that he adopted has become one towards which other artists have moved. His pictures are often intensely evocative, like snapshots from a stranger’s photo album, yet bring the viewer’s attention to the methods of their creation, to the brushstrokes, drips and other techniques that are writ large across the surface, emphasising the objecthood and illusory nature of painting itself. Doig was born in Edinburgh before being raised in Trinidad and Canada. He studied art in London, partly wishing to go there because it was the home of punk, the music he to which he listened a great deal during teenage years in Toronto. He went to the Wimbledon School of Art in 1979, followed by St. Martin’s School of Art. Later, at the end of the 1980s, having spent a few years back in Canada, he returned to London for a Master’s course at the Chelsea School of Art. 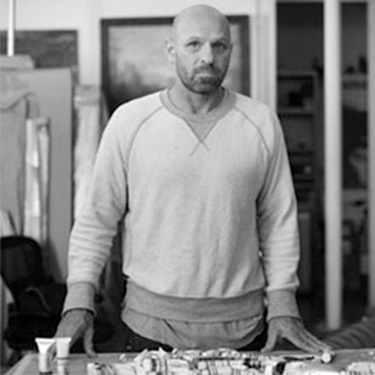 Between St. Martin’s and Chelsea, Doig had exhibited only sporadically; however, it was around the beginning of the 1990s that he began to gain increasing recognition for his pictures such as White Canoe, painted during his time as a student. His return to London had galvanised him: 1991 was an annus mirabilis, as he was awarded both the Whitechapel Artist Award and the Barclays Young Artist Award, the latter after a group show at the Serpentine Gallery, London. In 1991, Doig was part of a group working on the restoration of the Unité d’Habitation, an idealistically-conceived building designed by Le Corbusier in the wake of the Second World War, which had since fallen on hard times. This led to the creation of some of his best-known and best-recognised groups of works, showing utopian architecture as though through a tangled web of vines, the ideals of yesteryear seeming abandoned by the march of history. Doig painted Le Corbusier’s Unité d’Habitation several times, for instance in Concrete Cabin of 1991-92. He also painted other related pictures inspired by similar encounters with architecture, for instance The Architect’s Home in the Ravine, which was rooted in his memories of Canada and based on his own snapshots. These pictures, with the buildings fleetingly seen through the foliage, complicate the entire nature of seeing, the entire nature of representation, the entire nature of painting. These notions were to prove fertile arenas for Doig’s further development, as exemplified in his pictures of ski resorts and pictures inspired by film stills. They all demonstrate to what extend Doig is an artist rooted in the process of painting. As he has explained, ‘Painting is about working your way across the surface, getting lost in it… [The size of paintings] is about the idea of getting absorbed into them, so you physically get lost’ (Doig, quoted in R. Schiff, ‘Incidents’, pp. 21-43, J. Nesbitt (ed. ), Peter Doig, exh. cat., London, 2008, p. 33). In 1994, he was nominated for the prestigious Turner Prize. Doig has subsequently returned to Trinidad, having initially been offered a residency there and subsequently making it his home from 2002. He has continued to explore similar themes in his more recent works, yet often taking different directions, never ceasing to include the range of references and motifs, be they from Honoré Daumier or the movie Friday the 13th, that make his pictures all the more intriguing. In 2008, he was celebrated in an extensive retrospective exhibition shown at Tate, London.